Raised by my social activist grandmother in a matriarchal home, where questions were encouraged and dissent meant taking responsibility. Growing up I didn’t have much of a problem saying NO. It was also easy because back then in the 70’s my environment wasn’t crowded. We didn’t have a TV or radio at home, and most conversations were in the garden about whatever was going on. Not what someone (media) thought and told us about what was going on. But as I grew, It got increasingly difficult to decide what to say Yes to. As the number of things in my environment increased. People included. The last 3 decades seem a swoosh of “items” that kept adding – because I kept saying yes. Books, hobbies, activities, clothes, – getting to more ‘important stuff’ like ideologies – theories – courses – questions – and yet the same problem of – Too much stuff. This also infiltrated in my work. In the guise of value addition and customisation- Mature models, thinking partnership, solutions for clients and organizations we had gone far far away from focus and essentialism. The action list looked long and confusing. And often when asked, “What do you do?” My mind had a mini episode of blanking out. Clouded by ALL the many things we did do. It was no longer the Essential – the Simple – the Clear. I said “Less is more” – But in reality I found myself saying it a lot more and doing it a lot less. Instead of feeling better it made me feel heavy, confused – weighed down. Thinking of what to do – took more time and energy than actually doing it. And in moments of Quiet time – I have often asked myself and my colleagues and even clients(sometimes in middle of long winding meeting and endless conversation and complex models and perspectives) – “What do we want? – What do we really want?? Sometimes this question changes form to – Who are our customers, What is our place in the world?, What is our offering really? -Why do we come to work everyday? The ‘quintessential’ question is often followed by a long silence…. pause… like someone is slowly pulling the veil off – an done can actually feel the brain wheel turning in the new space as if looking at the same place for the first time. Bhageeratha was the king of Kosala, a kingdom in ancient India. He was a descendent of the great king Sagara of the Suryavamsa, or Sun Dynasty. He was one of the forefathers of Lord Rama, of the Ramayana, the epic in which Bhageeratha tale is primarily recounted. Bhageeratha was commissioned to free his ancestors who had been cursed into becoming Stones. And it was said that the eight generation (Bhageeratha) would be able to free them. And they would be free when the waters of ganga (the holy river) touched them. The only problem – ganga didn’t live on the earth back then, she lived in heaven. And so the great king Bhageeratha went to her and asked her to come down. Amused she asked why? And he recounted his need and purpose. Ganga told him that even if she did agree, which she was not inclined to anyways, to come down her force would drown the earth. Bhageeratha was a man on a mission – and he was going to problem solve this one as well. And so he asked what could he do to bring her down in more efficient ways. She told him that that the only person who could do that was Lord Shiva. And that Bhageeratha would have to do very hard and intense penance to get Shiva to do this. That was all Bhageeratha needed to know – the how. He would do whatever it took. His mission statement was clear- Free ancestors. And so he began. After years of hard work and penance, Lords Shiva finally appeared and was pleased with the sincerity of Bhageeratha efforts. And so he asked him, “Tell me what to you want? “ – I want to free my ancestors and they can only be free if the waters of Ganga touch them, and Ganga can only come down to earth f you bring her down. That was a clear ask. What follows from this point in the Story is very important, the Conversation Shiva has with Bhageeratha. Shiva said, You have done your work, I can do what ask of me – very easily- Get Ganga down to earth. But, tell me Bhageeratha, When your ancestors become free – What would they Want?? – What did they want before they were cursed? Bhageeratha did not have an answer. Shiva then went on to tell him – that the “Curse” was really a blessing in disguise – because They did not know what they wanted they had to be kept in “suspended animation’ – lest they do more harm to themselves and others in going after, or doing things they actually did not want. And so once they knew the answer to “What do you want? “– the curse would be lifted. Till them they would be kept safe from themselves. Once they knew the answer to “What do you want? “– the curse would be lifted. Let us just take a pause – and ask ourselves in this moment – from personal or profession life – What do I want”? The question – and hopefully its answer will lead to Clarity of What to say Yes to and What to Say No to. What does this look like in organizations? Cluttered product lines, crowded marketing messages, busy in meeting syndrome, no time-no space for development of people, lots of motion little room for emotion, disengaged people, process as the main strategy for influencing, confused customer, dwindling sense of ownership and fulfilment. So, What do we do? how do we get back to basics. 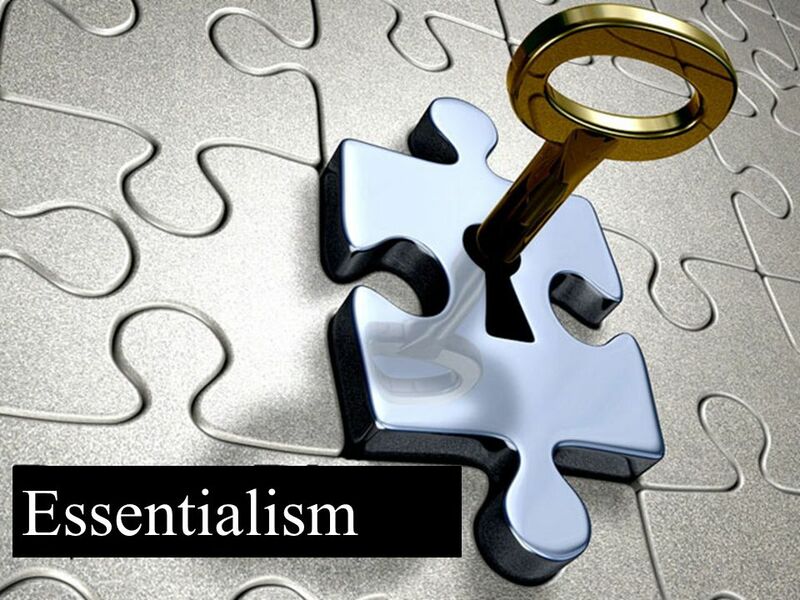 3 Suggestions – Practices from the Essentialism point of View. 1. Reflect and Act on “What do I want” – Get clarity of which direction would your life, teams, organization strategy point in the direction of. There can only be One north start. Practice – Ask: If I could give 100% to things that would be Pivotal in making a difference what would they be? – delegate everything else. Practice – Ask : What is my/our- when stripped off of everything what will undeniably remain ? 4. Move from Motion sickness to Momentum – be able to discern between activity and accomplishment. It very easy to feel important. We have collapsed the link of Being busy with with being important. And conversely, Less busy means less important. – Trapped. Practice Ask: every time you hear yourself say “I am busy” – Pause –and ask Busy doing what? Do I feel like I Am I moving or Do I feel I am stuck. Hopefully we can have a Simple – Elegant and fulfilling way of functioning and relating with each other and ourselves. Experimenter by choice... Designer by Profession...and Curious by nature. I am intrigued by the mystery that is life and the possibility to participate in this game of creation. The world can be a better place all it takes is a Perspective of Compassion and Courage.